Are you more of a do-it-yourself (DIY) type? If so, build your own X-Stream Hybrid Pro Hand Dredge and save over $50! Since this is the most popular and well developed suction pump in the world, several essential features of the X-Stream are proprietary and produced only for Gold-N-Sand. Examples of this are the patented valve system that reduces clogging and allows the user to replace the diaphram flappers (if needed). In addition, the leather cups are cut 1/16th less than the diameter of the plunger tube, which allows the cups to absorb water and swell to make a tight seal that is self-lubricated by the water. For these reasons and more, it would be impossible to build one without this DIY kit. The instructions in this kit also allow you to make a totally submersible pump, if you want one, and to customize the length of your pump. You will need basic carpentry tools, safety glasses, a warm place to work and possibly some music. 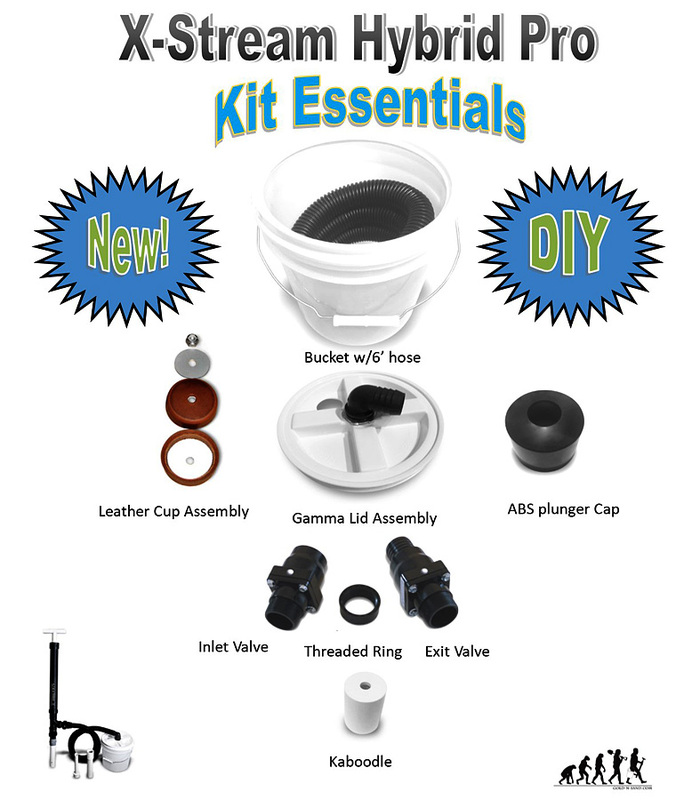 You'll also need to go shopping at your local hardware store to get common items (see photo of items NOT included in this Kit that you will need to buy). Your Kit includes complete written step-by-step instructions of how to make a hand dredge using parts in this kit, plus items you will purchase on your own. No guessing! The detailed instructions show you exactly what you need to buy and what you get in this kit, and what to do. Check out the 3 minute video below, too! Shipping weight and dimensions of this kit are approximately 4 lbs., 10 x 10 x 10 inches. FREE BONUS! Each kit includes a DVD of the movie "Gold Men." It's a funny spoof on the Discovery channel's popular "Gold Rush" TV show. The DVD in this kit features "Red" Steve Wilcox, the inventor of the hand pump and a few of his friends having too much fun urban gold prospecting in Denver. An option to this DIY Hand Dredge Kit is to buy the X-Stream Hybrid Pro Hand Dredge already done for $157.98.